29-Apr-2007 -- Salimos de Guadalajara el 28 de abril a las 5:30 de la tarde el rumbo a Compostela, Nayarit, situada a 210 Km. rumbo a la ciudad de Tepic. En esta ciudad pasamos la noche, para recuperar un poco las fuerzas y salir temprano hacia la búsqueda del punto. Alrededor de las 5:15 de la mañana hora local, aprovechando la primera luz de la madrugada tomamos la carretera que lleva a Mazatán, a 18 Km. al suroeste, a través de carretera pavimentada y terracería. Tras preguntar sobre los lugares de interés de la zona encontramos que existen ruinas arqueológicas y balnearios. La dependienta de una tienda en Mazatán nos mencionó que se podía llegar al poblado de La Mesa del Rodeo, el cual aparecía muy cerca del punto 21ºN 105ºW en las cartas del INEGI que llevábamos, al cual no teníamos la certeza si se podía llegar en vehículo desde ahí. La vegetación de la zona cambia en los 20-25 Km. que hay que recorrer hacia el sur. De Mazatán hay que subir por terracerías empinadas de suelo arcilloso, desde unos 680 m hasta los 1100 m, donde abundan los cafetales y la vegetación es más densa. Después se recorren unos 4 Km. a la misma altitud (con una vista excelente al oeste donde quizás a lo lejos se puede ver el mar en un día claro) y se comienza a descender hasta unos 600 m, y mientras se desciende el bosque se hace más seco y algo más llano. Más o menos a la mitad del descenso se pasa por el asentamiento de Rancho Viejo, en el cual solo algunas casas de las existentes permanecen habitadas, se sigue bajando por el camino hasta la bifurcación, que a la izquierda lleva a La Mesa del Rodeo y a la derecha se incorpora en algunas partes al cauce del Río Las Conchas (totalmente seco), que se dirige más hacia el punto. Tras dejar la camioneta sobre el río nos encontrábamos a 1500 m de la confluencia. Para aproximarnos escogimos recorrer unos 500 m hacia el oeste para luego cruzar un cerro, muy difícil de subir, hacia el sur. La vegetación es variada: árboles con raíces gruesas de unos 25-30 metros de altura, hojas secas y plantas llenas de espinas. Aun estando cerca de los 600 m de altitud, y su cercanía a la costa del Pacífico, la temperatura no es muy alta, ni la sensación de humedad es notoria. Se podría describir la zona como un bosque tropical de vegetación densa. El regreso hacia la camioneta fue mucho más sencillo, ya que descubrimos otro río seco que desembocaba en el río Las Conchas, había veredas con la pendiente bastante plana y el ganado cercano indicaban que ésta era la ruta correcta para llegar. El punto en sí estaba a unos 40 m de este río seco en un paraje lleno de árboles altos. Escogimos esta fecha por dos razones: la primera, que esta época del año es de sequía y la otra, que es el primer aniversario de nuestra visita al punto 20ºN 104ºW. 29-Apr-2007 -- We departed on April 28th at 5 pm from Guadalajara to Compostela, Nayarit, located 210 km (130 mi) on the way to the town of Tepic. We slept in Compostela to recover a little our strength and around 5:15 am, by taking advantage of the first lights of dawn, we drove the road towards Mazatán, 18 km (11 mi) Southwest from Compostela. At first the road was paved, then it turned to a dirt road. After asking to the dwellers about places of interest in this zone we found that there are archaeological ruins as well as seaside resorts nearby. The hostess of a grocery store in Mazatán mentioned it was possible to reach the village of La Mesa del Rodeo, that appeared quite close to the point 21ºN 105ºW according to those INEGI maps we brought, to which we weren’t quite sure being able to reach it on our vehicle. The vegetation of this area changes along the 20-25 km (13-18 mi) that must be driven to the South. From Mazatán you have to climb through steep dirt roads of clayey soil, from an altitude of 680 m (2230 ft) to 1100 m (3610 ft), where coffee plantations abound and the jungle is denser. Afterwards you drive some 4 km (2.5 mi) at the same altitude –with an excellent view to the west, where you can maybe watch the sea on a clear day- and the you start to descend until 600 m (1970 ft), and while going down the forest gets dryer and somewhat flatter. More or less half of this downhill you pass through the village of Rancho Viejo, where only few of the existing houses remain inhabited, While keeping down on the road you end at a fork, that to the left it leads to La Mesa del Rodeo and to the right it incorporates in some moments to the bed of the river Las Conchas (completely dry), that goes closer to the confluence. After leaving the truck on the river bed we were 1500 m (.93 mi) from the confluence. In order to approach we chose walking about 500 m (1500 ft) to the west just to cross a hill, very hard to climb, to the south. Vegetation varies. 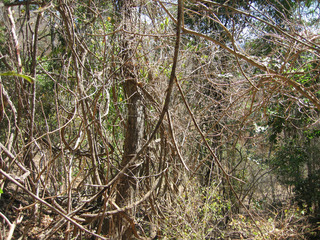 20-25 m (65-80 ft) tall trees with thick roots, dry leaves and thorny plants. Even the fact of being at an altitude about 600 m (1970 ft) and the closeness to the Pacific coastline, the temperature was no too high, and the moisture sensation wasn’t notorious. The landscape can be depicted as a tropical forest with dense vegetation. The return to the truck was much easier, since we discovered another dry creek that flew to Las Conches river. There were paths with low slopes and the surrounding cattle showed this was the right way of approaching. The confluence itself was about 40 m of this dry creek within a spot full of tall trees. We chose this date for two reasons: the first, this is the dry season and the second this is the first anniversary of our visit to the confluence 20ºN 104ºW. 29-Apr-2007 -- Wir sind am 28. April um 17.30 Uhr aus Guadalajara nach Compostela abgefahren, das 210 km im Weg nach Tepic liegt. In diesem Dorf übernachteten wir, um die Stärke wiederzubekommen und um früh zum Punkt abzufahren. Gegen 5.15 Uhr Ortszeit, beim Ausnützen der ersten Lichter des Morgens, haben wir die Straße nach Mazatán genommen, das 18 km Südwesten aus Compostela liegt. Nachdem wir die Bewohner über die Sehenswürdigkeiten auf dem Gebiet fragten, fanden wir, dass es in der Nähe archäologische Ruinen und Badeorte gibt. Die Angestellte eines Kioskes erwähnte es war möglich das Dorf La Mesa del Rodeo auf Pkw zu erreichen, das sehr nah vom Punkt 21ºN 105ºW auf unsere Karte INEGIs erschien. Zu diesem Ort waren wir nicht ganz sicher ob man durch Mazatán erreichen könnte. Die Vegetation des Gebiets ändert sich durch die 20-25 km die man nach Süden fahren muss. Aus Mazatán führen die Feldwege durch steile sowie tonige Flächen, die von 680 m bis 1100 m Höhe klettern. Da ist die Landschaft reich an Kaffeepflanzungen und die Vegetation wird immer dichter. Danach fährt man etwa 4 km auf der selben Höhe (mit einem ausgezeicheten Blick westlich, wo man vielleicht an einem klaren Tag das Meer sehen kann) und dann beginnt man bis etwa 600 m Höhe runterzufahren. Durch diese Strecke wird der Wald trockner und ein wenig ebener. Etwa in der Mitte dieses Abstiegs fährt man durch den Ort Rancho Viejo, wo nur wenige Häuser bewohnt bleiben. Man fährt weiter runter bis einer Gabelung, die nach links nach La Mesa del Rodeo führt und nach rechts mischt sich mit dem Flussbett des Río Las Conchas, der komplett trocken war. Dieser Weg fährt fast gerade an den Punkt. Als wir den Jeep verließen, befanden wir uns 1500 m von dem Punkt enfernt. Um uns zu ernähren sind wir 500 m westlich gegangen. Daraus haben wir einen Hügel südlich genommen, der sehr schwer raufzugehen war. Die Pflanzenwuchs variiert: Bäume mit dicken Würzeln, mit einer Größe von 20-25 m, trockne Blätter und dornige Pflanzen waren darum. Trotz der Höhe von etwa 600 m und die Nähe der Pazifikküste war die Teperatur nicht zu hoch und das Feuchtigkeitsgefühl auch nicht notorisch. Man könnte die Zone beschreiben, wie einen tropischen Wald mit dichter Vegetation. Der Zurückkehren ins Jeep war viel einfacher, da haben wir einen trocknen Bach gefunden, der in Las Conchas Fluss mündete. Es gab einen Pfad mit kleiner Steigung, und auch das nah gestehende Vieh zeigneten, dass das der richtige Weg war. Der Punkt selbst war etwa 40 m von dem Bach entfernt, auf einem Gegen voll mit großen Bäumen. Wir haben dieses Datum aus zwei Gründen ausgesucht. Erstens, diese ist die trockne Saison, und zweitens, das ist der Jahrestag unseres Besuchs zum Punkt 20ºN 104ºW.